Central Health will use this report to step up discussions and planning with fellow governmental, private, non-profit, academic, and community partners on how we address health inequities and disparities together. We invite you to join in this conversation and take action. This new report demonstrates that the young partnership between Central Health, the Dell Medical School at The University of Texas at Austin, and the Seton Healthcare Family is already improving health and increasing access for those who need it most. Central Health was created in 2004 by the voters of Travis County to ensure the availability of quality health care to low-income and uninsured residents. To help establish benchmarks and ensure Central Health adapts to the changing local health care environment, every third year Central Health’s Board of Managers adopts a new strategic plan. The 2017-19 Central Health Strategic Plan represents the fourth iteration of this guiding document. Since starting operations, Central Health has emphasized increasing the volume of health care services it funds for Travis County’s low-income and uninsured residents. For example, in 2015 Central Health funded more than 376,000 primary care visits, more than double the total from 2005. Additionally, Central Health continues to increase the number of unduplicated patients it provides funding for, with a five-year increase of more than 32,000 patients from 2011 to 2015. In 2012 – our community passed a unique ballot measure to invest additional funds in a health system transformation that would better meet the needs of our rapidly growing and aging, low-income and uninsured members of our community. 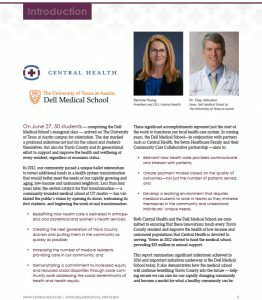 Less than four years later, the work Central Health has taken on with our partners, the Dell Medical School at The University of Texas at Austin and Seton Healthcare Family, has validated the public’s vision. Central Health and the Dell Medical School released on Sept. 7, 2016, their second such annual community benefit report about the benefit these efforts are bringing to the community. 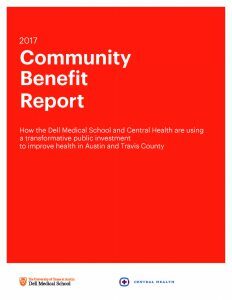 The 2015 Community Benefit Report is the first annual update to Travis County taxpayers on the ways the 2012 Proposition 1 election, which includes funding for the Dell Medical School at The University of Texas at Austin, is directly contributing to the health of our Central Texas community. The 2015 report was delivered by Dr. Clay Johnston, dean of the Dell Medical School at The University of Texas at Austin, and Patricia A. Young Brown, president & CEO of Central Health, on Thursday, Sept. 17. A copy of the report is available to download as a PDF below. The mission of Central Health is to provide access to health care services for those Travis County residents who need it most. As a public taxing entity, Central Health relies on public funding to work toward its goal of ensuring everyone has access to high-quality health care services. In the decade since voters created Central Health, residents have continued to support the organization’s mission. This was demonstrated once again in 2012 when voters approved a proposition to increase property taxes to support new initiatives in health care delivery for the safety net population and community at-large. The rapid population growth Travis County experienced during the past decade has had far-reaching effects on those Central Health serves. Affordability issues driven by skyrocketing housing prices—particularly in Central Austin—have forced low- income populations away from the city’s core. Areas such as East-Central Austin are experiencing demographic shifts as long-term residents are priced out of the housing market. To ensure Central Health continues its mission to provide health care access for the county’s underserved population, it is important to monitor demographic trends. Tracking the movement and growth of the county’s racial/ethnic groups, age 65-plus population, and lower income families ensures Central Health can effectively respond to future challenges and opportunities. This report was developed as a tool to help guide how and where Central Health and its partners will continue to support our county’s most vulnerable residents. In 2010, Central Health designated eight planning regions to analyze and compare the needs of the population across geographic areas of Travis County. The Central Health planning regions are roughly equivalent shares of the population (approximately 125,000 people per planning region) and align with existing transportation corridors and geographic boundaries affecting transportation. They do not align with existing political or other boundaries, as they were designed for health care planning purposes. Central Health conducts regular analysis to track and understand overall population trends, with a focus on uninsured Travis County residents with incomes below 200 percent of the federal poverty level. This presentation covers our latest geographic analysis of Travis County and includes current and projected trends relative to age, poverty, and race/ethnicity. For additional information, or to receive a printed copy of this report, please contact info@centralhealth.net. 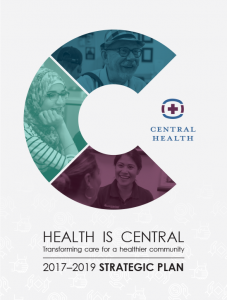 Central Health’s Fiscal Years 2014-16 Strategic Plan focuses on increasing access to care and transforming how that care is delivered, with the ultimate goal of improving health in our community. The Strategic Plan is organized under foundational pillars approved by the Central Health Board of Managers – Health Care, Health Promotion, Health Coverage and Health Infrastructure. Expanded clinic hours allowed for 8,000 new visits at the CommUnityCare locations in the Central Health Southeast Health & Wellness Center and at the North Central Health Center, representing a 6.8 percent increase in total visits at CommUnityCare health centers participating in the Expanded Access project from FY14 to FY15. Increased provider capacity and access to specialty care including 1,224 additional gastroenterology and 1,529 additional pulmonology visits over FY14, exceeding FY15 targets by a combined 1,331 visits. The establishment of a third mobile health clinic in FY15 provided 4,406 encounters in FY15 including a new Street Medicine clinical team that served 302 homeless patients. Central Health effectively leveraged local funds by providing a total of $132.3 million as intergovernmental transfer (IGT) for three programs, Delivery System Reform Incentive Payment (DSRIP), uncompensated care (UC) and disproportionate share programs (DSH). These three programs returned a total of $319.8 million to network providers. In other words, for every $1 in local funds sent as an IGT, a total of $2.42 was earned through matching funds to support Travis County health care. The Community Care Collaborative (CCC) Population Health Workgroup reviewed and improved tobacco use screening, and referrals to cessation programming in support of a DSRIP Category 3 outcome measure. By the end of the measurement period, the CCC’s contracted providers reported that over 94 percent of Medical Access Program (MAP) patients were being screened and receiving cessation counseling—exceeding the outcome measure by 14 percent. Through collaborative efforts between Central Health, the City of Austin, and Travis County, Healthy ATC was launched to help spotlight some of our community’s most critical health disparity priorities: tobacco, obesity, HIV, and diabetes. One of the first outputs of Healthy ATC was a web-based resource: www.healthyatc.org – a web portal that empowers Travis County residents with data, tools, and resources about the health of the community. The Central Health Equity Policy Council was formed with 60 community partners empowered to work on closing the gap in health disparities in Travis County. Activities to increase awareness and encourage enrollment in local, state, and federal health care programs increased 181 percent over FY14, with staff participating in 188 outreach activities in FY15.Central Health and its affiliated partner, Sendero, significantly exceeded the enrollment target of 2,500 by enrolling 6,000 members in Sendero’s IdealCare – twice as many as were enrolled in FY14. Central Health advanced the master planning process for the redevelopment of the Central Health Brackenridge Campus. Activities included an extensive community engagement process which reached more than 8,400 community members and the establishment of the Brackenridge Advisory Team to encourage input and advance partnership coordination. Phase 2 construction progressed on the Central Health Southeast Health & Wellness Center. A Community Resources Center opened at the Center to offer social services in compliment with the medical services provided at the facility. Central Health continued to coordinate the Regional Health Partnership (RHP) for Region 7 and hosted two learning collaboratives in FY15 for RHP 7 partners. The first event in February included 110 DSRIP providers and project managers and the second in September included 174 DSRIP providers, project managers, and public attendees. Health information technology infrastructure was enhanced with the implementation of a new analytic tool as a preliminary phase of developing a data warehouse. 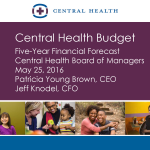 Central Health develops a new strategic plan every three years to inform and guide our work and the development of our budget. Each plan is developed to prioritize work that addresses identified community needs, is informed by the evolving healthcare and policy environment, and considers available funding. While Central Health has historically focused on expanding access to care services, the FY14–16 Central Health plan marks a significant shift for the organization—focusing on not only increasing access to care, but transforming how that care is delivered in order to improve health outcomes. This shift is necessary to address the current inefficiencies and high cost of care as well as take advantage of historic opportunities that are promoting healthcare transformation. The current delivery system is not meeting the needs of the current target population, and with the Travis County population continuing to grow and age, simply increasing access within the current system will fall far short of adequately addressing needs. 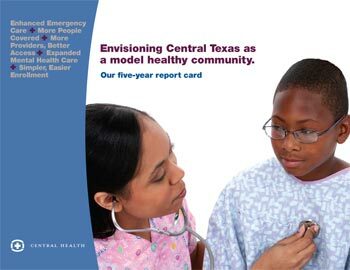 In 2004, Travis County voters created Central Health to improve the state of health care for our most vulnerable residents. Since then, we have not only enhanced and expanded access to essential healthcare services, but also worked with numerous community partners to transform the local safety-net healthcare system. The work we are undertaking today, including the 1115 Waiver, the Community Care Collaborative, our participation in the creation of the Dell Medical School, and soon the redevelopment of Brackenridge Campus, will fundamentally impact and improve the quality of health care for every resident of Travis County. With your help, we are leading the way to better health for all Central Texans. Central Texans share a strong sense of community pride. There is a deep belief that the Austin area represents the “gold standard” in many factors that determine livability, such as economic development, revitalization, and population growth. Residents in Greater Austin expect similarly high-quality health care. Cancer has overtaken heart disease as the number one cause of death in the Austin Metropolitan Statistical Area (MSA) – including Bastrop, Caldwell, Hays, Travis, and Williamson counties – and is one of the top health concerns cited by Austinites. Health Resources in Action (HRiA), a public health consulting firm headquartered in Boston, MA, was commissioned by a collaborative of three funders – Central Health, the LIVESTRONG Foundation, and the Shivers Foundation – to develop a white paper describing the availability of quality clinical cancer care and support services in the Greater Austin region. HRiA has extensive experience conducting community health assessments to identify the needs and strengths of a particular community in order to: improve its health status, inform funding decisions, and help prioritize program development and implementation. 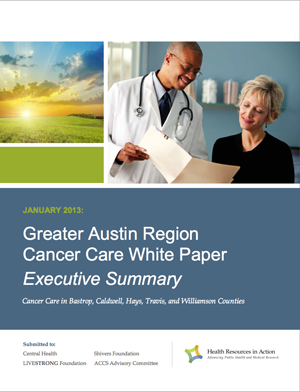 The purposes of this Executive Summary are to provide an overview of the main elements of the Greater Austin Region Cancer Care White Paper. This Executive Summary is organized around collaborative “Consensus Statements” agreed upon by Austin-area cancer care experts (i.e., Advisory Group). Importantly, this Executive Summary and the complete White Paper are not intended to be comprehensive reports of all aspects of cancer care in the Greater Austin area, and there are limitations to how these data should be considered given the limited data available. We recognize that there is more work to be done to elucidate the full picture of cancer care in the Greater Austin area and envision this white paper as a starting point for collaborative regional improvement efforts. From August 2011 through July 2012, Austin/Travis County Health and Human Services Department (A/TCHHSD) partnered with Travis County Health and Human Services and Veterans Services, Central Health, St. David’s Foundation, Seton Healthcare Family, and the University of Texas Health Science Center (UTHSC) at Houston School of Public Health Austin Regional Campus to lead a comprehensive community health planning initiative. The Austin/Travis County Community Health Assessment (CHA) represents a collaborative and community participatory process in order to illustrate our health status, strengths, and opportunities for the future. This report is available at the Austin / Travis County Health and Human Services Department’s website at: http://www.austintexas.gov/healthforum. For additional information, please e-mail CHACHIP@austintexas.gov or call 512-972-5888. 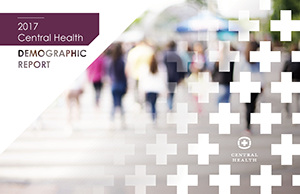 Central Health in partnership with the Austin Area Research Organization is releasing a new white paper which asks and answers the question: Why care about health and health care in Central Texas? 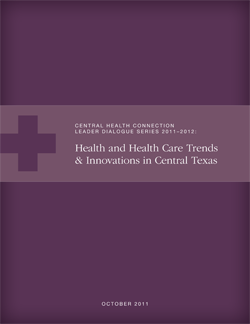 This white paper provides a snapshot of Central Texas’ health and health care status. Our community must work together to address the health challenges we face, such as high rates of obesity, diabetes, and heart disease. We cannot wait for health reform or other changes to address the issues and there is no quick fix. Health and health care are personal and local and integrally tied to sectors such as the economy, education, and workforce development. We have the ability to make significant improvements in our region’s health status by making changes at the personal, organizational, and policy levels. Central Texas is growing faster than the system needed to support a healthy, diverse, and prosperous community. To address the issues of cost, coverage, and illness, we need to build and sustain an effective health care system and an infrastructure that supports healthy lifestyle choices. This is critical to the quality of life and economic prosperity of the region. Looking ahead, there is an opportunity—and a responsibility—for everyone to take part in improving our region’s health. Public and private organizations in Central Texas are poised to make a greater impact with a coordinated effort focused on health and health care infrastructure development.